Windshield Replacement ADAS Calibration. We Recalibrate Windshield Sensors. Technology is constantly changing, and windshields are no exception. Your windshield is not just a piece of glass. In many newer model vehicles with advanced driver assistance systems (ADAS) there are cameras, sensors and other equipment mounted on the windshield that can affect how your car functions. As windshields become more complex, so does the process for replacing them. At Auto One, we are experts at windshield replacement, including ADAS calibration. We have the expertise, tools and technology to get you back on the road safely. When a windshield is replaced, all the ADAS equipment such as cameras and sensors are removed and re-attached. A change in camera angle of just one degree can have a huge impact on the camera's viewing area, which can affect how the vehicle's ADAS features will work. The calibration process adjusts and tests all the cameras and sensors on the windshield to ensure they are still working properly after it is replaced. Without calibration, the vehicle's ADAS features may not function properly, which can lead to an accident. Even though it sounds simple, calibration is a complex process that requires special equipment and training. The technicians at Auto One are experienced with ADAS calibration using a custom tool called Opti-Aim™. 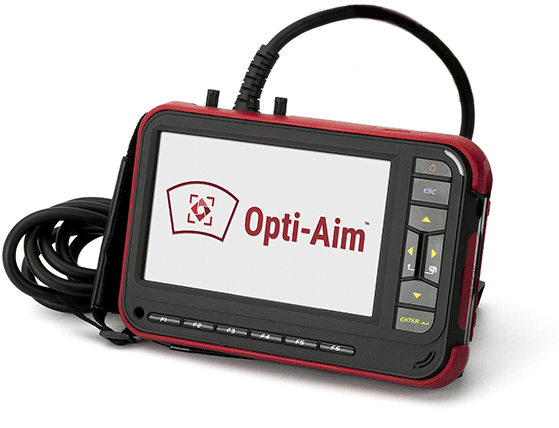 Once connected to the vehicle, Opti-Aim™ begins the camera aiming process and then works with the vehicle's computer to optimize camera alignment and restore it to the manufacturer's specifications. How long does ADAS Calibration take? The Opti-Aim™ calibration process typically takes about 30 to 45 minutes. It can be completed during the same visit as your windshield replacement. Auto One uses a process called dynamic calibration, which requires the technician to drive the vehicle to calibrate the camera. The technician needs to wait at least 30 minutes for the windshield to set before the calibration process can begin. You should plan to leave your vehicle with us for at least a few hours if you need this service. Does my windshield need Calibration? Consumer Reports has a tool to show which makes and models of vehicles have ADAS features. Any of the vehicles listed with ADAS features will most likely need calibration. Your email will not be distributed, sold, or traded with any third party. Your email is used for business communications. You may receive periodic official offers from Auto One. What is Changing with ADAS? Advanced driver assistance systems, commonly referred to as ADAS, have made cars much safer in recent years. This includes features such as lane departure warnings or forward collision detection that can help drivers avoid an accident. The ADAS features rely on cameras, sensors and other equipment that is mounted to the vehicle's windshield, as well as other locations. ADAS features are becoming more common. The number of cars with some form of ADAS is expected to increase by about 24 percent each year. In the past, ADAS was an optional feature, but in response to increasing government regulation automakers are making some ADAS safety features standard on new vehicles. For example, all new vehicles sold in the U.S. will have autonomous emergency-braking systems by the year 2022. When you call to make an appointment at Auto One Glass and Accessories to get your windshield replaced, you will be asked a list of questions about your windshield. Here are a few of the most common ADAS and driver's assistance features and how to know if you have them on your car or truck. You will know if you have rain sensing wipers if your windshield wipers automatically turn on when it starts raining. This feature typically depends on a square sensor panel that is mounted on your windshield near the rear view mirror. If your headlights turn on automatically as soon as it gets dark, then you most likely have light sensing headlights. The light sensor may be located on your windshield, either behind the rear view mirror or next to the rain sensor. It also may be located on your dashboard at the base of the windshield. A heads-up display is a safety feature that projects information onto your windshield, such as your speed or engine conditions, so you can keep your eyes on the road while driving. You will know if you have this feature if you see images on your windshield while driving. If you have your windshield replaced, the heads-up display will need to be reconnected and tested. A shade band is a strip of tinting, usually about 3 to 6 inches long, that is located at the top of your windshield. It helps to minimize glare from the sun while you are driving. You will know if you have this feature because the top portion of your windshield will be darker than the rest of the glass. If you have a shade band, you should let your technician know so they can make sure your new windshield also has that feature.